BARCELONA: Barcelona forward Luis Suarez said his side had taken two steps towards wrapping up the La Liga title after beating closest challengers Atletico Madrid 2-0 at home on Saturday to open up an 11-point gap at the top of the table with seven games left. Barca had struggled to break down a fiercely competitive Atletico long after Diego Costa had been sent off for the visitors for a verbal outburst at the referee but Suarez finally beat Atleti’s outstanding keeper Jan Oblak in the 85th minute. Captain Lionel Messi scored the second goal one minute later and the 90,000 Barca fans crammed into the Nou Camp began to chant “champions” as they sensed they were closing in on an eighth domestic title in 11 years. “This was another game which shows just how hard it is to win the league and we deserve a lot of credit for what we’re achieving.” Defeat by Atletico would have trimmed Barca’s lead to five points and coach Ernesto Valverde underlined the importance of the victory. “We’re very happy because we know exactly what Atletico are, an enormous team who scrapped until the end with 10 men. 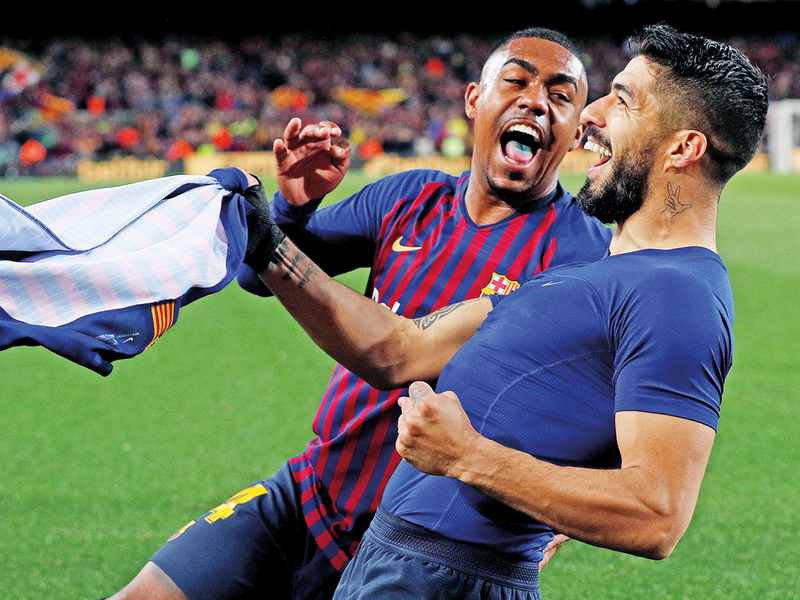 We were giving everything and Luis’ goal was like a shot of adrenalin.” Having taken a huge step towards the title, Barca can now focus on their Champions League quarter-final first leg against Manchester United on Wednesday and Valverde said he would have to rotate his squad.